Tara and Tyler are probably the most adventurous couple I've ever photographed. And their proposal story speaks to it-- Tyler, being a pilot, flew Tara over an airfield where her friends and family were on the ground with giant signs reading "Tara will you marry me?". Definitely not a dry eye out there... even mine! So when they were deciding on a location for this engagement session, they wanted to go somewhere just as full of adventure as their proposal had been, and different from any session they had seen before. 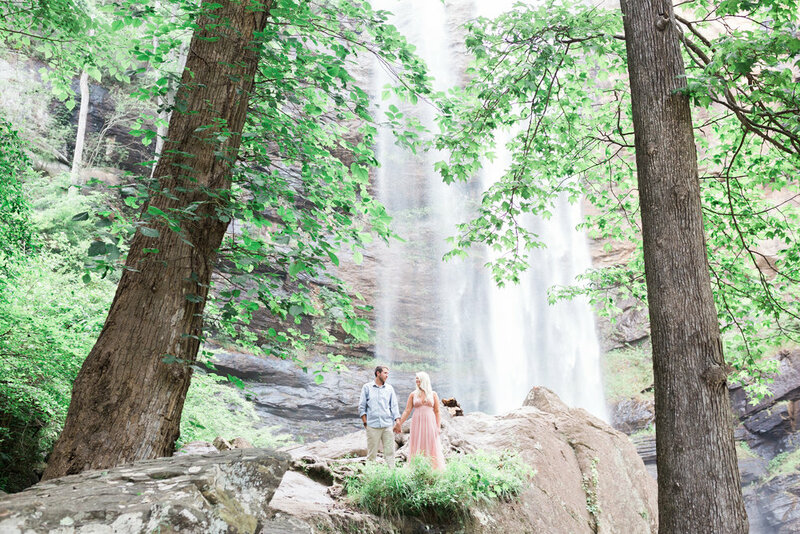 So we decided on Toccoa Falls in the North Georgia mountains, where Tara hiked across giant rocks in 4-inch heels, and Tyler picked her up in rushing water under a waterfall. All of us left the session a little soggier for the wear, but really excited to see the magic we created in this beautiful setting. Between Tara's killer planning skills, their sweet love for each other, and their incredible kindness and hospitality towards others, their wedding next April is definitely a day I'm counting down to!